Image size: 12 X 8 in. Shortly before his death in April of 1996, Stephen Lyman was named one of the top artists in the country by U.S. Art magazine and the Greenwich Workshop Press published his book, Into the Wilderness: An Artist’s Journey. Already known for his wildlife in situ paintings, Lyman’s fine art print career was soaring following a series of campfire and Yosemite landscape paintings that placed the viewer inside the scene. He was only age 38 and had just begun to experiment in another painting style, which Companions exemplifies. 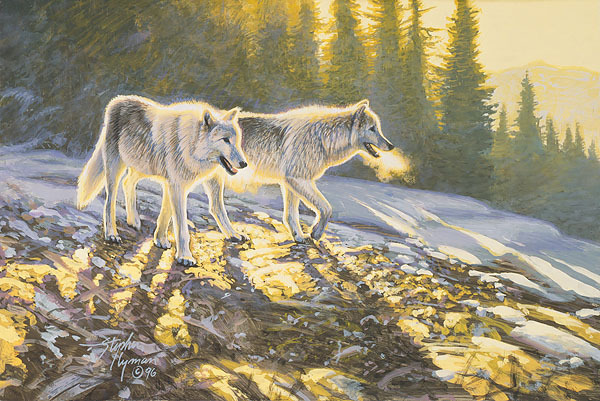 With a looser painting style than his earlier work, it is more a painting of light than subject, as though the wolves allowed the artist to better depict the sunrise as it shimmered through the pines, crossed their fur backs and lit up their frosty breath. For Lyman collectors and those who have just discovered him, this Smallworks™ will light up a corner in your world.